Around 200 years later, and after the British Colonies were established in the New World, the first “American” casting facility was started in Saugus, Massachusetts. That casting facility, Saugus Iron Works, was opened in 1645 and also enjoyed tax exemption along with a 20-year monopoly on all iron production courtesy of the Massachusetts General Court. Almost 300 years later, this origin of the American iron and steel industry finally became a National Historic Site in 1968 after being a private museum ran by the Iron and Steel Institute for 15 years. While the exact year is disputed, sometime between 1756 and 1767 came the transformation of the rail industry when Richard Reynolds, not the U.S. Foil Company one, started replacing existing wooden rails with cast iron rails for the transportation of iron and coal in Shropshire, England. Around that same period, seven men with foundry backgrounds have their signatures on the Declaration of Independence. Among the more noteworthy foundry men to sign the most famous document in history, George Taylor was an ironmaster and Colonel in the Pennsylvania Militia, he started his career by shoveling coal into furnaces at Warwick Furnace, Rock Run Furnace, and Coventry Forge before eventually owning Durham Iron Works; his company was the first munitions supplier for the Continental Army, producing grape shot, cannon balls, bar shot, and cannons. George Ross also signed the Declaration of Independence and had significant ties to the iron industry. Ross’ company was responsible for building many furnaces and forges, including Mary Ann Furnace and Spring Forge. Adding to his resume, Ross was also a Colonel in the Continental Army and was a judge on the Admiralty Court of Pennsylvania where the issue of state’s rights became a focal point for the newly-established country. Besides his contribution to ironworking and America’s independence, Ross’ son married Betsy Griscom, who was later known for making the first American flag. Shortly after the American Revolution, centrifugal casting became the latest innovation for the casting industry. While the general idea of utilizing centrifugal forces to produce castings had been known for some time, A.G. Eckhardt obtained a patent in 1809 which unveiled the physics and benefits of this new process. Less than a decade later, Mount Joy Forge, later known as just Valley Forge, was the first to produce cast steel in the US. Besides the dealings of George Taylor and George Ross, as well as steel production at Valley Forge, Pennsylvania has been home to many innovations in metal working not only in America, but around the world. This sentiment continued to be proven true in 1837; the S. Jarvis Adams Co. developed the first molding machine to be commercially available in markets. Furthering the development of this machine led to the first die casting machine patent in 1849 by J.J. Sturgiss, it was used to supply the growing need of lead type in the rising newspaper industry. 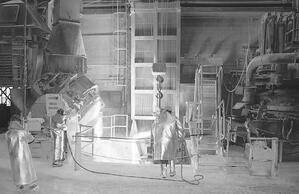 The 20th century was host to the explosion of casting technology and processes that most modern methods are based on. Seven years after the end of World War I, x-ray technology was first used to determine the quality of a casting. After that breakthrough, all castings made for US Military aircraft were required to pass such inspections to be accepted. 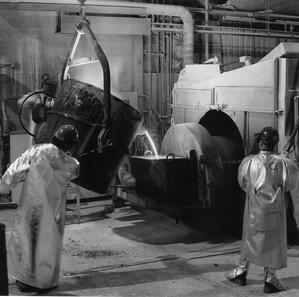 The next major innovation to the casting world came half a century later when ESCO Corp. was the first steel foundry to make alloys through the process of Argon Oxygen Decarburization (AOD) in 1973. Until this point in history, there was no widely-available method for simulating metal solidification or filling molds until programs such as MAGMA-soft, ProCast, and Flow3D appeared on the market as mold simulation solutions in the 1980s. In the early 1980s, MetalTek International pioneered a new process called near-net shaping which combines various shaping technologies, such as sand casting and investment casting, with the high-integrity centrifugal process to maximize the benefits of each. Net-shaping can be readily added to add O.D. 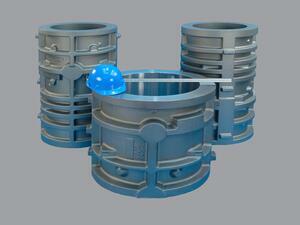 profiles to centrifugally cast components through the use of sand, ceramic, or split graphite dies. True net-shaping at investment casting levels of O.D. detail can be added by employing MetalTek’s proprietary net shaping technology and special tooling. In addition to reduced cost due to savings because of reduced metal used, near-net shaping and net shaping centrifugal casting enables tighter quality control, especially in applications where alloy solidification behavior is a problem. Finally, since shaping is casted in versus machined in, customers realize a savings in machining costs. Finally, the latest game changer for the casting industry came from the Department of Energy Metal Casting Competitiveness Research Act enacted by the US Senate and House of Representatives in 1990. This bill focused on providing funding and resources to conduct research on technology in the area of metal casting to ensure industry competitiveness, energy efficiency, national security, and economic well being in the United States. The CFD (Computational Fluid Dynamics) Project led to the creation of the Arena-Flow software; this software was designed for cutting-edge engineering in pattern formation. While other programs focused mainly on a single aspect of the casting process, like fluid dynamics or solidification, this program combined many adjustable variables together to get a reliable and consistent pour when it came to casting metals in different shapes and alloys.